Rwanda government has expressed concern at the strain in relations with Uganda but promises to keep engaging the northern neighbour to fix the existing diplomatic issues. The assurance was made during a media briefing session by Ambassador Olivier Nduhungirehe, Minister of State in the Ministry of Foreign Affairs, Cooperation and East African Community. “Rwanda Government will keep on collaborating with the Government of Uganda to solve escalated tensions between the two countries,” He said. On World Refugee Day, Uganda’s State Minister for Relief and Disaster Preparedness Musa Ecweru punched holes into the relations of two countries after making stingy comments at a refugee camp. “While there are millions of refugees running away from fear and prosecution, there are those who come posing as refugees but with intentions to undermine security of the country and well-being of refugees in Uganda and warned such people to stop,” the Ugandan minister said. The Ugandan minister singled out countries including; Rwanda, Somalia and Burundi saying that some of the countries where refugees come from, send intelligence officers and wrong people to kidnap and at times kill refugees. “We continue to work together to find solutions to the problems between our two nations. The two Head of States met on several occasions as well as the two Foreign Affairs Ministers to talk about the situation,”Nduhungirehe said. He explained that One of the decisions that has been made is to relaunch the Joint Permanent Commission (JPC) that will meet in the coming weeks to relaunch the bilateral relations between the two countries. 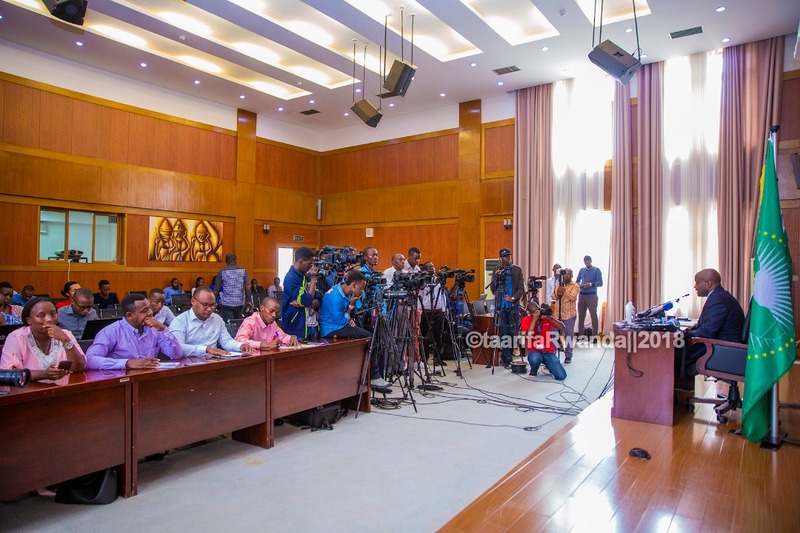 Journalists both local and international were also informed about the upcoming high level visits including Heads of State of Mozambique Filipe Nyusi, China’s Xi Jinping, and the Prime Minister of India Narendra Modi. Meanwhile, while commenting on the Arsenal – Rwanda deal which recently caused sharp debate on social media platforms across the globe, the Minister confirmed that Arsenal club players will fly to Rwanda in a bid to promote the Visit Rwanda tourism brand and Rwanda football at large. Rwanda’s goal is to double tourism receipts from $404 million by 2024. ‘Visit Rwanda’ will be emblazoned on the left sleeve of players in Arsenal’s first, under-23 and women’s teams. The Arsenal shirt is seen 35 million times a day around the world. The Arsenal teams will visit Rwanda and club coaches will host coaching camps to support the development of football in the country. The Visit Rwanda deal is expected to boost the country’s visitors from the current 1.3 million visitor arrivals in 2017 with some 94,000 of them visiting the country’s three national parks, Nyungwe, Akagera and Volcanoes. ”The deal is normal business. You can’t expect that tourism will all of a sudden come to increase without promotion. This is what we are doing and Arsenal is a team that is very popular all over the world,” Nduhungirehe said. He also said Rwanda wants to develop and promote its tourism sector, the three-year partnership with Arsenal will help in that sense, but it will also promote football in Rwanda as coaches and players of Arsenal will also come to Rwanda to promote Football.